Quite a few business owners are hesitant to allow 3rd party vendors and customers to digitally transfer money to their business accounts. They are afraid of “bad guys” or hackers obtaining their checking account number and draining it. After all, we business owners are concerned about having the money needed for payroll and “bill pay”!! No wonder we don’t sleep like we used to. Well, how about this for a suggestion. It’s not a sleeping pill, but instead, it’s good cyber advice. Instead of just one business checking account with your bank, open a 2nd checking account. Now use this 2nd checking account as your internet facing account. Meaning, use this account to send and receive payments to and from your customers, vendors and business colleagues. But wait; don’t I still have a potential cyber risk exposing money to the Internet? Many banks and financial institutions today can notify you, via text or email, when money is received or sent from an account. So your exposure to cyber threats will be very short. Now, if money comes in, simply make an internal transfer of the money from the 2nd checking account to your primary business checking account. There. The money is no longer exposed to cyber threats AND it is transferred to an account that you have not told anyone about. Now you’re in control and you win using this method. By the way, this strategy can also be used for your personal accounts. 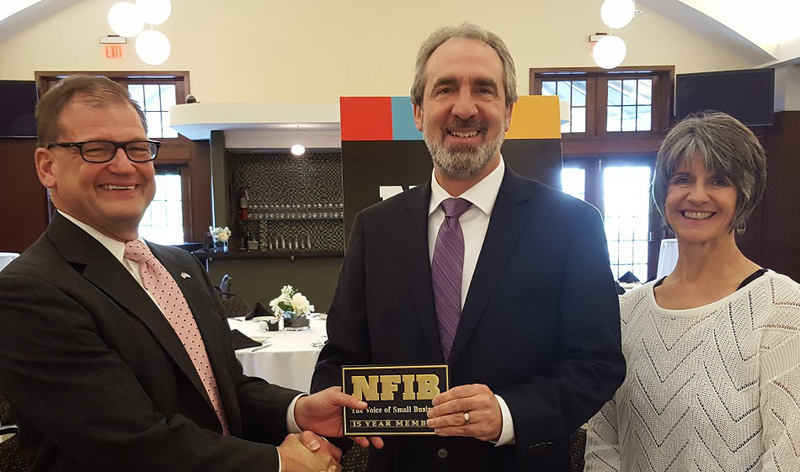 Allen Perk receives his 15-year member plaque from Roger Geiger, Vice President & Executive Director of NFIB/Ohio and Ty Baker-Baumann, Leadership Council Chairman. The above views and comments are those of XLN SYSTEMS. Allen Perk is the owner of XLN SYSTEMS, a software and network security company he has owned since 1991. Allen is a 15-year member of NFIB who regularly attends its State Board meetings and is Chair of the Central Ohio AAC. Allen also serves on the Ohio Attorney General’s Cyber Security Advisory Board.